Isaac Hayne was a South Carolina Militia Captain who was hung after breaking parole to fight with the Continental Army. Hayne’s death inspired thousands of men to sign on with the Patriot Forces and led to the victory at Yorktown. Isaac Hayne was a verified Patriot serving in the South Carolina Militia when Charleston was captured by the British. Hayne was one of the large group of prisoners who were paroled with the understanding that they would not again take up arms against the Redcoats. Hayne took the opportunity to return home and see his family. His household had been struck with smallpox and one of his children had already died. Soon after Isaac arrived home the British again came calling. They demanded he sign an oath of loyalty to the Crown or be sent to prison. Not only were the British prisons notoriously filthy and disease ridden, but Hayne’s family needed him. Isaac signed the oath out of necessity, coupled with a handshake promise that he would not have to serve in the British Army. Of course, the local Officers reneged on this deal and demanded he take to the field. Feeling that his agreement had been broken, Hayne decided that his parole had been violated and he was free to rejoin the Continental Army. He was given a small group of men to lead, and they were able to capture Andrew Williamson (who was thought by most Americans to be a traitor but was actually working as a secret agent). Fearing that Williamson would be hung, the Redcoats set out to free him. They soon surprised Hayne and his men, freeing Williamson and taking Isaac prisoner. The British decide to hang Hayne. This was done without a trial and without the ability for an appeal. Hayne attempted to have this overturned based on the claim that he was either a British subject (who deserved a trial) or a POW (who could not simply be executed based on the Rules of War). Isaac Hayne was hung on August 4, 1781, less than three months before the Victory at Yorktown. General Nathaniel Greene asked permission from George Washington and Congress to exact revenge on captive British Officers. This matter, along with the Fort Griswold Massacre, was considered by Congress but, as had happened before, they decided against revenge because the Americans had always maintained a ‘we’re not going to stoop to their level’ policy. At least two thousand men fled British controlled Charleston and joined the Continental Army. This gave General Greene the manpower needed to participate in the Battle of Eutaw Springs, and important engagement leading to the Battle of Yorktown. 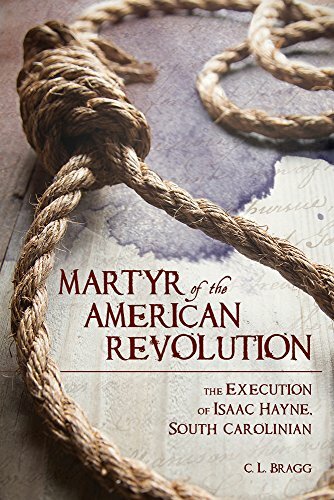 His death may have been unnecessary, but Isaac Haynes might very well have done more to secure the blessings of liberty to his country in death than he would have as a Militia Captain. Do you want to read about other Martyrs of the American Revolution? You can subscribe to my email list here. You might also want to support Founder of the Day on Patreon. Want to learn more about Isaac Hayne? He is actually one of those Founders who we know very little about but has several biographies. ‘Martyr of the American Revolution’ is really the only full-length biography. Pick up a copy through the Amazon affiliate link below (you’ll support this site, but don’t worry, Amazon pays me while your price stays the same).